SALT LAKE CITY – Jason Spencer, show director for Webb A/V, used High Resolution Systems' UDC-400 Universal Device Controller to support the AV needs for the recent North American regional convention for Nu Skin Enterprises at the Salt Palace Convention Center. The UDC-400 is a software-based control platform designed to simplify setup and improve control over devices using IP (TCP/UDP) or serial (232/422/485) protocols. Spencer used the UDC-400 to control the output of the router from FOH so he could view the different sources and two preview/program feeds on his monitor. 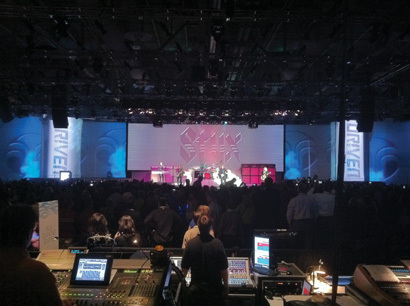 For the Nu Skin events, which included general sessions, breakouts and a performance by Styx on the closing night, the AV setup included three edge-blended screens spanned the 200-foot width of the stage and a fourth edge-blended screen positioned behind the center display to act as a scenic backdrop. High Resolution Systems provided a seven-frame Christie Vista Spyder system to feed the screens and a Lightware Visual Engineering 32×32 DVI router for source management. Sources for the screens included live cameras, PowerPoint content and elements from four main sync rolled Playback Pro machines, one dedicated to each screen. The displays were busy illustrating everything from keynote speaker Kevin Carroll's address to Styx's performance. Drew Taylor built the controller interface for the UDC-400, which he ran on his computer backstage where he operated the Spyder system on a Montage II console. He took advantage of the UDC-400's web server feature to provide Spencer with an interface on an Apple iPad. "Jason had my iPad on a little stand on the desk next to him in the Front of House so when he switched his monitor he could look at all the different sources," Taylor said. "I customized the interface with his company logo that spanned four buttons not in use. That branded the iPad as his. It was a way to impress the client and get them excited about UDC and my involvement on the show." "I loved the iPad and UDC software – it was so valuable that I wish I had it on every show," said Spencer. "It simplified things dramatically. It made it easy for me to see what I wanted on my Front of House monitor and not have to ask anybody about it. Through the iPad I could control what was displayed on my video monitor, whether PowerPoint, prompter, cameras, any source. I'd highly recommend it for any show director sitting out at Front of House." Taylor noted that, from his perspective backstage, his intercom communications with Spencer were also facilitated by the UDC-400. "It was easy to talk about what source was next, and helpful for troubleshooting and when we were building slides, screen looks and other elements during rehearsals. Jason and I could show the Nu Skin client different screen looks with iPad control from the Front of House." Spencer noted feedback from Nu Skin calling the convention "their best show ever" and commended Taylor and High Resolution Systems for the assist they provided, calling Taylor "extremely knowledgeable." For more information, please visit www.hrscontrol.com.